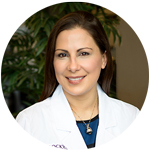 Dr. Saucier (saw-seer) strives to provide her patients with the best dermatological care available anywhere with the goals to consistently deliver improvements to patients' well-being as she provides great service and high-quality results. These objectives are common among the entire staff at Rockwall Dermatology: they are fundamental to our work. The patient-centered focus for Rockwall Dermatology is largely derived from Dr. Saucier's extended clinical experience in a dual residency program in both Dermatology and Internal Medicine at the University of Wisconsin in Madison, WI, where she rotated through inpatient wards, intensive care units, emergency rooms, urgent care settings, outpatient clinics and consultation services all the while practicing state-of-the-art, evidence-based medicine. She served as Dermatology Chief Resident in her final year of her five-year long residency. Before her residency, Dr. Saucier earned a Doctor of Medicine degree from UT-Southwestern in Dallas, where she was inducted into the Alpha Omega Alpha Honor Medical Society for her scholarly achievements. While in medical school she began her professional commitment to give back to the community by volunteering at a number of camps and clinics relating to dermatology care. She was passionate about dermatology long before she moved from her hometown of Dallas to Boston to study Biology at Massachusetts Institute of Technology (MIT) in Cambridge. Dr. Saucier's passion and extensive training for skin care makes her equally adept in diagnosing and treating all sorts of skin conditions, from straight forward to complex, as well as performing results-oriented cosmetic procedures. A system of health care that revolves around the patient, good communication, appropriate care, and our devotion to continuous improvement. That's how we practice dermatology and it's noticeably better. Just read what our patients say. Board-certified dermatologists are the experts in treating medical issues involving the skin, hair, and nails. A board-certified dermatologist is the preferred physician for a number of cosmetic medical treatments. "Dr. Saucier is attentive and clearly interested in symptoms, their causes and corresponding solutions. Furthermore, her treatment plans are subsequently effective and reasonable. She doesn't over treat and is clearly more interested in patient success and satisfaction than in any easy profit scheme. She's one in a million!"